So how does Crewbay work for boats? Our goal is to provide volumes of choice for recreational boats and structured quality for professional recruiters. With over 50 crew registering per day, Crewbay works hard organising and pushing forward the right crew or candidate that suits your crew vacancy. First we need to get you signed up. 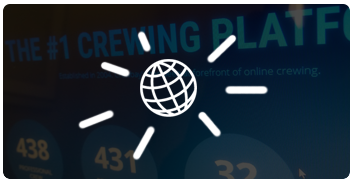 Crewbay already gives you a taster of what's available by allowing you to search and view crew profiles. Once signed up, we'll take down your crewing requirements which will automatically generate a beautiful advert and you'll have full access to contact crew. Crew - Quality and quantity! Once your advert is up, crew will start to apply (if a paid job) and message you (if a recreational opportunity). Dependant on the crew you're looking for, Crewbay will provide the necessary interface to either manage applicants (pro) or manage messages (recreational). Crewbay is a bespoke website designed to find you the right crew. Whilst we understand it's nice to kick those feet up and let the crew make contact with you. You can enter the crew pages, filter your requirements, view profile after profile, quickly and efficiently. For even more candidates, you have the option of becoming a Premium member. This allows you to add more content, add direct contact details, discount advert boosts, ID verification, multiple adverts, no message restrictions and lots more. Feature your advert. This will boost your advert to the top of the boat listings, offering more visibility to prospective candidates. Add an 'Urgent' banner to your advert and get listed in our 'Urgently seeking' area... or do both! When you've found your candidate, made contact and are super happy with the service we provide, tell us about it! We never get tired of good news stories.